I know this isn’t a new idea, but it’s a good one, and so adorable! I found this mailbox filled with suckers and camo Valentine’s at a discount store for $2.50. 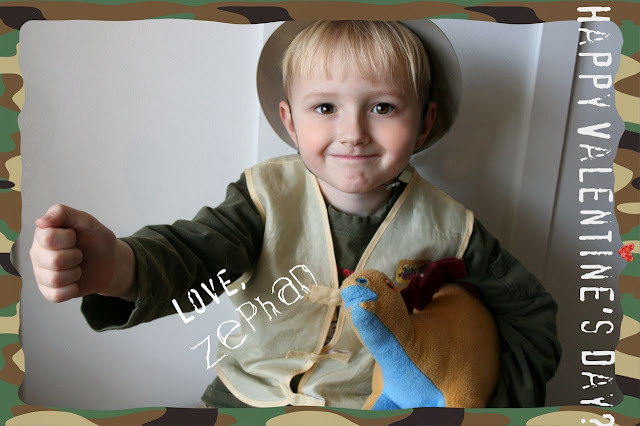 Going with the “Friends Like You are Hard to Find” theme, I had my little paleontologist dress up in his gear and hold his hand out to the side. Next, I uploaded the picture to picnik.com and added the camo frame and text. I measured the size of my original Valentines, inserted my photo into a Word document and sized them appropriately. Then, I printed them out on photo paper and cut them out. You could glue these to your cards using a variety of methods. I’ve had these photoslips for over a decade now so decided to finally use them! If you have a mini hole punch, it would be perfect for this next step. I didn’t have one, so simply used an ice pick to punch my holes. You want to punch under the thumb and then right below the pinky. Lastly, insert your sucker stick into the holes and you are done! 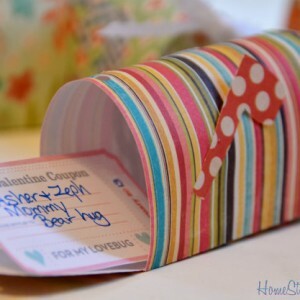 This is a great trick to use when you want to customize store bought Valentine’s in a jiffy! Enjoy! up a blogging site such your own: http://www. Those are so much more fun than the normal valentines!! I love it! I seriously might try this. These ARE the cutest and so is he! Oh those are SO cute! Hmmm, I don't know what's cuter, the idea or your little man. Ha ha! Wish I had seen these before the big day. Oh well! Hey Beth I hadn't been by in awhile-super cute! I've looked through a LOT of valentine ideas this year, and this is the BEST valentine idea I've seen! I swear it's the perfect combo of being cute/creative and being easy to do. Thanks so much for posting this! I didn't have time to try this idea this year, but it's already on my list for next year!! totally adorable! My son's school disallows any treats and candy so their Valentine's Day celebration is treat-free-BOO! Cute boy and cute valentines! I have a little dinosaur-lovin' boy, too! It's an exciting world! 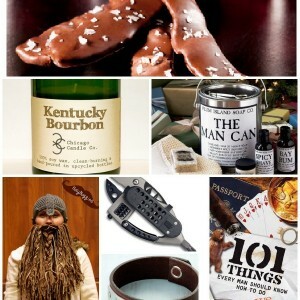 This is so cool and I love me some picnik…bummer I just read it today… a little late, maybe next year! hi..i'm one of your new follower.. i love this idea.. it's perfect door gifts for my son's birthday party.. This so just so cute! Aren't you the brilliant one, Beth?! You crafty girls are so good at coming up with great ideas like this. Love it & yes, your baby is adorable. Such a cute boy version! Zephan looks so sweet. We should get together sometime. Blog talk. Unless you're all talked out from Bliss;) We can meet at my house too if you want. I just rearranged my living room so things are about as clean as they'll ever be. Hurry while it lasts! So very cute; it almost makes me wish I had little ones again to do them for! Instead; I'm going to forward this to my daughter (for next year). If you ask Abby what her favorite color is, she'll respond, "Camo." Thanks! Beth, these are ADORABLE! what a cute idea! Happy Valentine's day! How cute and clever. Love it! Thanks for sharing. Might be an "old" idea to some of the uber creative people out there but its new to me and the cutest valentines day card I think I have ever laid my eyes on….omg too cute!! And what an adorable subject (that surely helps) I love this and would love it even more if I had a little one to do this for…waaaahhhh! Always enjoy visiting your blog…please stop by mine, doing my first ever giveaway for a gorgeous french chair…. Oops, my father-in-law somehow logged into my computer, so Tony's comment was mine . . .loved these cards!! Now this is the most impressive valentine idea ever!!! This is sooooo awesome!!! LOVE it! This is the cutest idea EVER!!! You are sooo creative! Love it!! I love these! So darling! Thanks for the ideas! Can't wait to snag some of those mailboxes on clearance after valentines day! I just got through making these for both my nephews and my 2 year old! I LOVE them, such a cute idea! I love the photo valentines. Your boy is a doll. Yes, your boy is awfully cute!! His classmates are going to love these Valentines! What a great idea, thank you for sharing it! That is beyond cute!!!! I love it! awww! the cards and your baby are THE cutest! His friends will love them. soooo cute… I can't wait for my little ones to go to school and exchange valentine's, this year they are just exchanging the flu:( your little one is also very cute! That is so cute. I can't wait until I have kids so i can do thins kind of stuff (and plan birthday parties too)! That is an adorable Valentine! It may not be new…but I've never seen it before. Good Job!!! Come on over and visit me. I love these valentines!!!! i showed them to my 13 year old and tried to get her on board but it's not happening…enjoy these times..
Zephan is such a cutie. Love the cards. Maybe next year for me! Hope all is well. Ridiculously cute!! Such an adorable and creative idea! Once again, amazed by your creativity! I bought some Fun Dip Valentine's and thought I was mom of the year. 🙂 Those are SO cute!